This is a very interesting question that presents some interesting implications for the wider use of pharmaceutical drugs by “healthy” patients. But, to begin to tackle this problem, we first need to understand a bit about neurobiology and what an SSRI is and does to the body. Serotonin is one of the main neurotransmitters within the brain itself and has a role in the regulation of all manner of things inside and outside of the brain, including mood, social interaction, sleep, appetite, digestion, platelets, vasoconstriction, and growth of bone and other tissues. One of the main sources of serotonin in the body is the gastrointestinal tract, which allows it to regulate the speed of digestion. Although this wide-ranging value of serotonin to the body is important, we are specifically interested in what it does to the brain. As mentioned before, serotonin in the brain has a significant amount to do with mood and social interaction. It is thought that levels of serotonin positively correlate to improvement of these emotional states. Put another way, the more serotonin, the better you feel or, conversely, the less serotonin, the worse you feel. However, this is unfortunately an inexact science: no one has firmly determined how much “more” or “less” really is or even what “normal” levels are. But, before we go any further, we should discuss how serotonin does what it does within the brain. Serotonin, like other chemical neurotransmitters, is released by one neuron, floats across the synapse (space between the sending end of one neuron and receiving end of another), and attach to receptors on the other neuron. These receptors then activate cellular processes within the receiving neuron, resulting in one of many possible actions. This same process that influenced the receiving neuron in our example was also previously responsible for releasing the neurotransmitter to begin with, but that signal originated from yet another neuron releasing neurotransmitter. Essentially, neurotransmitters are passing a signal from one neuron to another down a chain and the specific neurotransmitter used elicits a particular response from the receiving neuron based on its ability to receive and use said neurotransmitter. When serotonin specifically is released, it is taken up by receptors on the post-synaptic (receiving) neuron then released back into the synapse. From there, the serotonin is taken back up by the pre-synaptic (sending) neuron for use again in another signal. This process is known as “reuptake” and is essential to understand going forward. Thus, serotonin only acts for a brief period of time before it is released back into the synapse to be collected back up and used again. As one might imagine, this process presents an important weak point in serotonin activity that can be exploited for medical purposes. 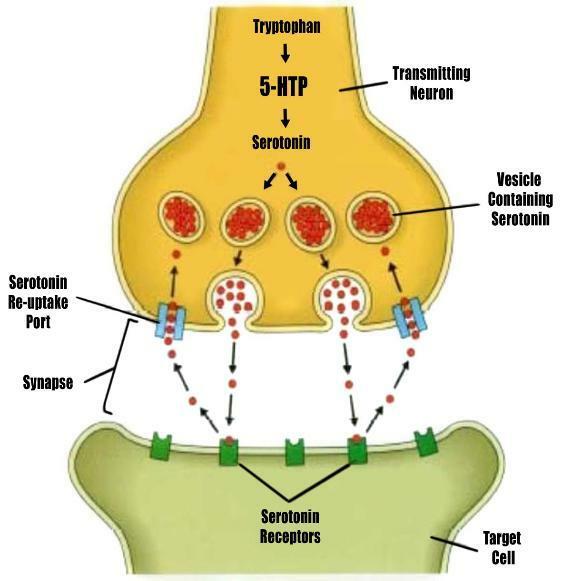 Diagram of how serotonin is released into the synapse, binds to the post-synaptic neuron, and is taken back up by the pre-synaptic neuron. Enter the SSRI, or selective serotonin reuptake inhibitor. This drug, used to treat many psychiatric issues such as depression and anxiety, specifically targets the reuptake of serotonin by the pre-synaptic neuron by binding to and temporarily disabling the transport molecules utilized for this purpose. This increases the amount of serotonin left free as well as the duration of its existence in the synapse. With serotonin freely in the synapse for longer periods of time, the post-synaptic neuron can be stimulated more frequently or with greater intensity than it ordinarily would. However, why would someone need to have serotonin last longer and in greater concentrations than it normally would? Recall, we operate under the general assumption that more serotonin has a positive effect, the so-called “Monoamine Hypothesis.” It is hypothesized that those suffering from issues such as depression and anxiety (which fit well within serotonin’s mood and social interaction modulating effects) must have a less than optimal amount of serotonin in play for one reason or another; theorized causes include a low number or genetic malformation of post-synaptic serotonin receptors or low levels released by pre-synaptic cells. Regardless of the reason, the results are the same because not enough serotonin is getting where it needs to go. The goal of the SSRI, then, is to artificially alter that balance. By preventing serotonin from being taken out of the synapse quickly, it gives the post-synaptic neuron a higher chance of transmitting the signal as it would under normal conditions. Another way to look at it is that SSRIs function as amplifiers for the already existing, but weakened, chemical signal. This “more-is-better” relationship does have a limit, however. All of that serotonin we now have floating around in the synapse in our example can also have a negative effect on the pre-synaptic neuron, causing it to produce less serotonin until it can adapt around the consistently high levels. This can cause a temporary increase in symptoms as the body adjusts to the medication and can also cause issues when the body is suddenly taken off the drug. Likewise, in a person without significant serotonin deficiencies in their synapses, an SSRI only has limited potential, as the post-synaptic neuron does not have unlimited sensitivity to the neurotransmitter. To address the question specifically, diving into the literature gives us some clues as to whether and to what extent an SSRI can impact normal function. Harmer, et al., published in 2003 in the journal Neuropsychopharmacology that administration of citalopram (brand name: Celexa), to healthy volunteers increased their ability to recognize facial expressions of emotion as well as modulating their reaction to these emotions. Specifically, they cite the possibility that through this increased emotional recognition SSRIs down regulate the fear response produced by the amygdala, the fear center of the brain, and thus decrease anxiety (which works for both normal and abnormal anxiety levels). Knutson, et al., published in 1998 in the American Journal of Psychiatry, that administration of the SSRI paroxetine (brand name: Paxil) for four weeks decreased hostility between individuals and likewise increased social interaction. On the other end of the spectrum, Gelfin, et al., published one month earlier in the same journal that a six-week course of fluoxetine (brand name: Prozac) yielded no discernable changes, positive or negative, in healthy patient behavior. In sum, it appears that administration of SSRIs to healthy patients has little adverse effect and the possibility of positive effects or, at the least, no effect at all. Why this is can only be speculated and may not be known for some time. But, the literature firmly derails any significant value of SSRIs to healthy people, including abuse potential. Thank you for the question, Shaina! Remember, anyone can submit a question by going to the “Submit Your Question” tab at the top of this page.